Andy Hughes has been recommended to me many times as people have got to know about my Beauty and the Beach… project as he has and still does create works with beach debris. He is also a leading light in Surfers against Sewage and happens to live in Cornwall, my neighbouring county. Looking for his material on line I was impressed by his website layout and the images therein. I found a second hand Dominant Wave Theory, a rather large tome produced with David Carson and illustrated with Andy Hughes images of beach debris. I understand from Instagram that he sent a copy to David Attenborough and has today posted that he received a lovely letter in thanks. I was disappointed to have found out about Andy Hughes recent London exhibition too late to attend. I have however emailed him to introduce myself as we may meet at an event for the MA Photography course early next year. He was kind enough to reply and say that he did not require and assistant at this time (I had enquired about gaining experience with him). I appear to be going over old ground in the sense that I have taken images and then find that others have taken similar ones a long time before mine. Andy Hughes is another example. I wonder which I should do first, instinctively take my images then read up about other photographers or visa versa. The latter way would be to sub consciously veer toward plagiarism perhaps. On the other hand armed with knowledge about composition, light and other details of settings used by the more experienced photographer I have a greater chance of taking a better shot and the potential to take a similar object or scene with a new twist as to how it was taken and/or how it was processed. Since viewing the images in Dominant Wave Theory and on the galleries on Andy Hughes website I have begun to get down low when taking some debris as he seems to have done. This has the effect of making a very small object large in a vast landscape and it is also interesting to see the landscape providing the context from afar rather than being a focus which happens to have a piece of debris in it. One example is of a red lighter on a beach which is lit up by natural light and possibly additional lighting to enhance its colour and form. An image that immediately stood out for me was that of Radion 1991 taken by Andy Hughes. 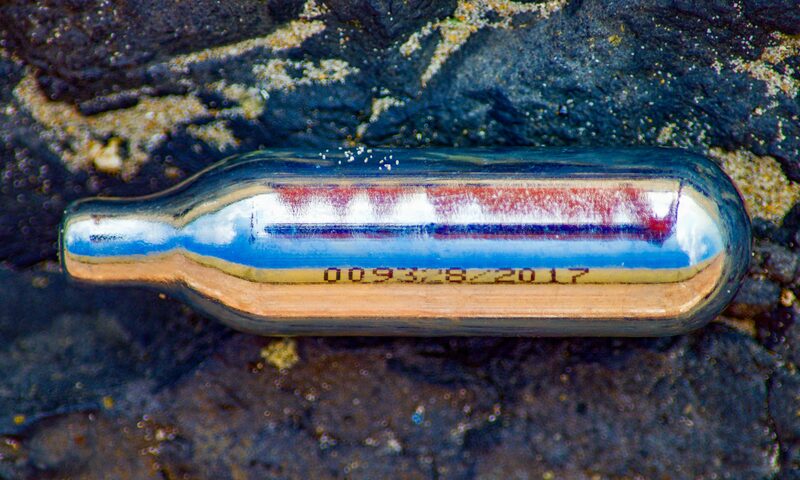 I took an image of a Jeyes cleaning fluid can on the beach and then in grass earlier this summer just after starting the course. His image is clear and carefully set as an orange plastic container against a dark brown background. Mine is photographed as found with not enough thought given to where my focus was when taking it. It was also tin not plastic apart from the top and to my mind very old as I have not seen a can like this since I was a child. I wonder what the back story is to its arrival on this specific beach? I took my image again on grass having risked taking it home (it still has fluid in it). I think my second image works better, although not on the beach. It makes me challenge my self-rule to date to photograph debris in situ without disturbing it (i.e. to view it in its abandoned stage where I first spotted it) rather than setting it up to showcase the item itself. I have noted that Andy Hughes is posting examples of new works. Some images appear to have been drawn or painted on and do have the effect of drawing me in wanting to know more about the processes he is using. Maybe I will be lucky enough to meet and ask him soon. Next PostNext Steep learning curve or high straight lines?